Fantastical: Natural language input makes this app throughly indispensable. Being able to just tap the mic icon and speak my appointment makes me really feel like I'm living in the future. Runmeter: Any run I do outdoors, I log with Runmeter. I've been using it for years, and it's the most accurate and robust running app I've ever used. I just recently got a heart rate monitor that pairs with it, so I'm excited to see how that integration will aid my training. Check the Weater: The simplicity of this app combined with its Dark Sky integration make it the only weather app I need to try. Plus, David Smith is an awesome developer (and human being). Google Maps: I'll occasionally use Apple Maps, and while it's definitely improving, it's still bit me too many times to trust on a day-to-day basis. Instapaper: All long-form articles go in here for future reading. If you're not using a read it later type service, you're missing out on a much more satisfying reading experience. Untappd: I've become much more of a beer enthusiast in the past year, and that's almost entirely due to this app. Untappd lets you log beers you've tried and suggests new ones to try. It has certainly turned beer discovery into a fun game. Scanner Pro: Apple recently made this app free for a week, and for great reason. I switched over to this app to log my business receipts about a year ago, and it's ability to auto-detect borders and quickly upload to Dropbox have made this app worth every penny I've paid for it. Day One: I made it a goal part-way through 2013 to start journaling once a week, and Day One is, bar none, the best journaling app on the App Store. Every Friday, I crank this bad boy open and review my week's progress. Every entry gets a picture as well, so that has encouraged me to keep photographing the exciting (or mundane) parts of my life. Twitterrific: I haven't tried Tweetbot, and thanks to this app, I really see no reason to. This app helps me manage my Twitter accounts very easily, and it looks gorgeous to boot. I also really enjoy the cool egg "pull-to-refresh" animation. Reeder: There's no better way to manage your RSS feeds than Reeder (combined with Feed Wrangler). The only thing I wish it did was allow you to send links to Reminders as a new reminder. But besides that, this is a fantastic example of an iOS 7 app, complete with gestures and the like. 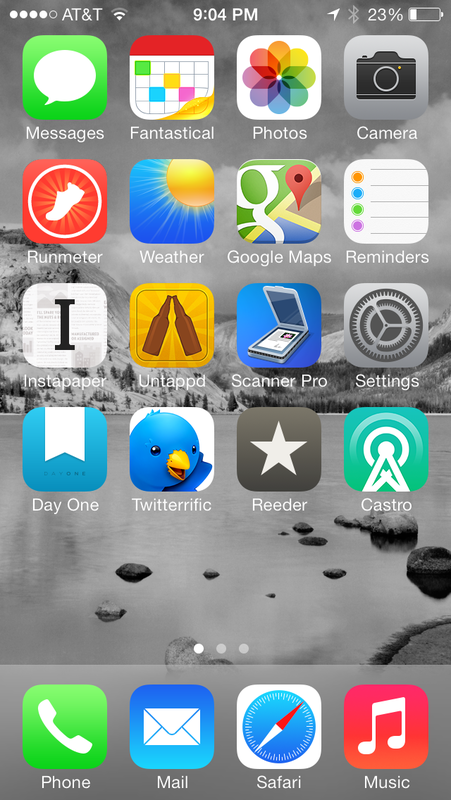 Castro: Speaking of amazing apps designed with iOS 7 in mind, Castro is a new podcast app that is crazy beautiful. The app is lacking in a couple of key features, like OPML import support and continuous play (and I also miss the gesture-based 30 second skip that Downcast uses), but it's pretty certain that those features will be added in time.